Working with animals can present a challenge for any photographer. While some animals are calm, most are energetic and want to play or wander off. 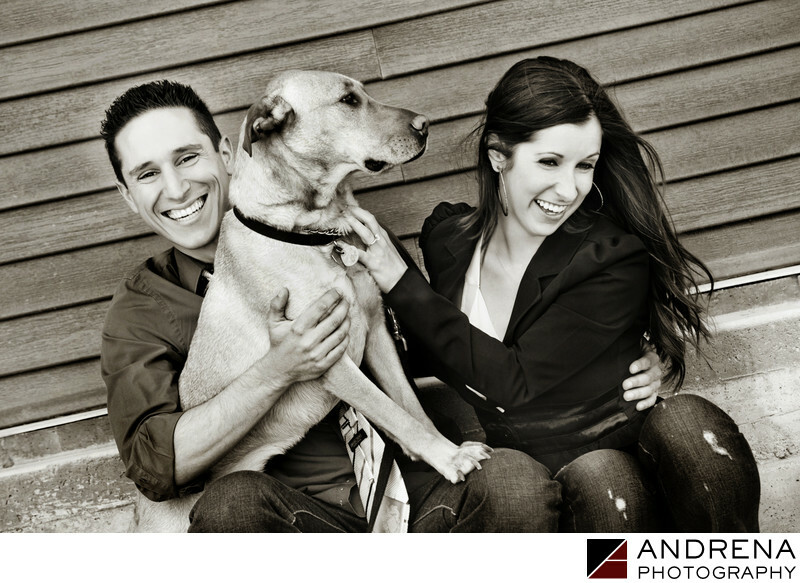 I usually suggest that couples bring a third person along to mind the dog if they want to include a pet in their engagement session. When my couple brought this darling yellow Labrador to their shoot, I was initially wondering if the dog's presence would hinder the engagement session. But the dog was so sweet, and he waited patiently during the couple-only photos. Of course, the dog eventually got bored, and decided to climb all over my cute bride and groom, which gave me the opportunity to capture this sweet image. Engagement session photographed in Venice, California.